In a Nutshell: Savannah, Georgia, one of the most charming and unique destinations in the US, is visited by millions of travelers each year. As a quintessential Southern town, Savannah’s historical architecture, picturesque town squares, and gracious hospitality make it a favorite among travelers. You can make the most of your trip to the city Conde Nast called one of the “world’s friendliest” by using your travel reward points to get there. I’ve yet to meet a person who doesn’t like a good vacation. And nothing makes a getaway more relaxing than being reimbursed for some of your expenses thanks to credit card travel rewards. And, depending on the credit card, reward points can be used for airline travel, car rentals, lodging, and a host of other travel-related expenses. So if you’re ready to cash in your credit card rewards for an exciting vacation, few places match the history, architecture, and charm of Savannah, Georgia. Even if you haven’t been to Savannah, you’ve likely seen images of this picturesque Southern town in movies, on book covers, or in ads. The city’s quaint squares, moss-draped oaks, and historic buildings lend themselves to some of the most iconic images we have of the quintessential Southern town. Savannah’s City Council takes pride in preserving the historical ambiance and charm of this unique place, while still offering some of the best shopping, dining, and sightseeing on the Atlantic seaboard. Walking through Savannah’s historic district and relaxing by one of the fountains in its many squares is like taking a trip back in time. Everywhere your eyes land is a reminder of the rich history of Georgia’s first city. Designated as a National Historic Landmark in 1966, the Savannah Historic District is one of the largest single landmarks in the country. The historic district’s boundaries roughly correspond to the city limits of Savannah prior to the American Civil War. Because of this designation, dozens of historic buildings are intricately preserved, including the oldest building in Georgia, the Herb House, built in 1734. VisitSavannah.com is the hub for all things Savannah and helps local businesses, visitors, and guests make the most of the city’s unique charm with a running list of festivals, restaurants, and other attractions. “Savannah has established itself as one of America’s top places to visit and being considered such a desirable destination is an honor that our community takes great pride in,” says Joseph Marinelli, president of VisitSavannah. 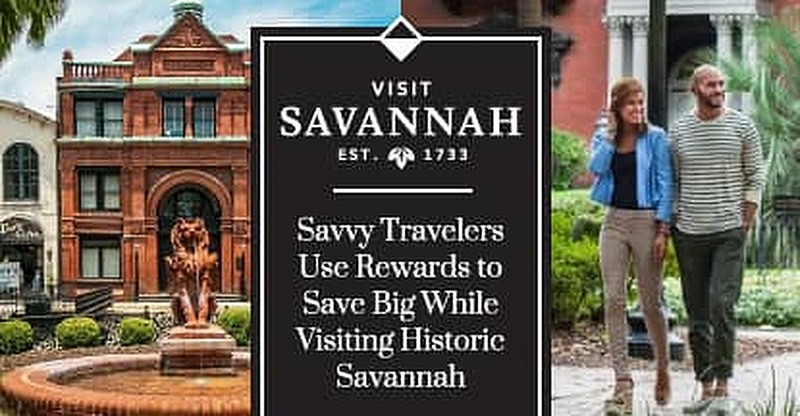 If you have unused travel rewards currently sitting in your credit card account, a trip to Savannah may be easier (and cheaper) than you think. Most credit card companies have redemption options that reimburse cardholders for travel expenses such as airfare, car rentals, hotels, tours, and attractions. Points are typically redeemable at a 1¢-per-point conversion rate on eligible purchases, though occasional promotions could make the points even more valuable. Most non-branded travel reward credit cards will reimburse for flights or hotel stays at any location and with any brand, while branded credit cards may be more particular with your choice of travel provider. Either option typically provides an online portal to access your account and cash in rewards for either statement credit, cash, or immediate discounts on your travel expenses. Savannah was founded in 1733, the year General James Oglethorpe landed on its shores with 120 settlers in his charge. Oglethorpe established the area as the 13th British colony in America, and named it Georgia in honor of King George II. With that declaration, Savannah became Georgia’s first city. Oglethorpe’s vision for Savannah was one of wide-open streets laid out in a grid pattern, with public squares and parks for townsfolk to gather. A total of 24 squares were built, of which 22 remain today. In designating certain areas of the town for residential, commercial, and recreational use, Oglethorpe created the first planned city in the nation. A walking tour of Savannah reveals dozens of historic buildings, including the Old Savannah Cotton Exchange. Completed in 1887, the Cotton Exchange was central to the city’s growth as the largest cotton port in America, and second-largest in the world. Other famous buildings include The Pirate’s House— an inn Robert Louis Stevenson featured in ‘Treasure Island’ — and Temple Mickve Israel, the third oldest synagogue in America. Perhaps the most visited, and certainly the most picturesque, points of interest in Savannah are the city’s squares. Each of the 22 remaining squares is lovingly maintained and offers visitors a chance to cool off by fountains while sitting under oak trees draped in Spanish moss. The bench, along with a plaque commemorating the scene, are a popular destination for travelers. If history, architecture, and beauty aren’t enough to win you over, Savannah also offers a world-class gastronomic experience. The city’s many top-quality restaurants serve excellent coastal cuisine, fine Southern cooking, and authentic Georgia barbecue. Some of the not-to-be-missed dining experiences include Mrs. Wilkes’ Dining Room serving its world-renowned fried chicken since 1943, as well as more modern establishments like The Grey—a former Greyhound Bus station refurbished with an art-deco theme. And remember, in Savannah every meal is complemented by a cocktail. “Visitors love Savannah’s beauty, true Southern hospitality, and enjoy discovering a mostly unexpected experience as they explore the finest in our coastal cuisine, retail offerings, unique array of lodging options, and some of the best shopping on the east coast,” Marinelli said. The truly adventurous, or maybe just curious, can check out one of the city’s many tours of haunted areas and hotels. Claimed by some to be “America’s most haunted city,” you’ll have no trouble finding tour guides with tales of ghostly encounters. Perhaps it’s the city’s long history, or the long-lost soldiers in its many cemeteries, but locals are convinced of their existence. Savannah is a great place for events and festivals because of its moderate year-round climate. The city boasts the second-largest St. Patrick’s Day parade in the US, along with music and art festivals throughout the year. The Savannah Music Festival takes place each spring, making it one of the best times of the year to visit the area. The Savannah College of Art and Design Film Festival, held each October, is another popular attraction. Other festivals and events include a family-friendly Fairy and Gnome Festival, numerous arts festivals, and the Tybee Island Wine Festival. There are tours of local hotels and gardens, including North of Gwinnett Street’s (NOGS) tour of Hidden Gardens, as well as guided and self-guided walking tours throughout the city. 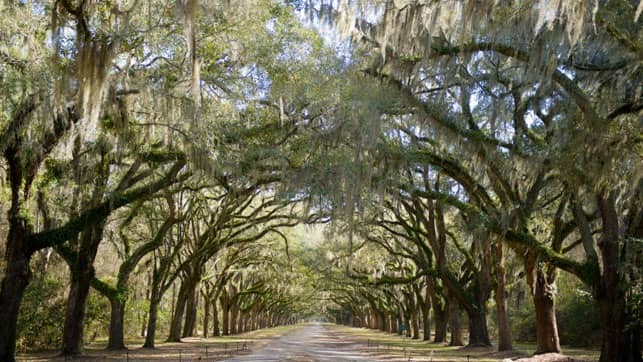 Savannah, Georgia, has miles of moss-draped oaks that make for a relaxing evening stroll. First-time visitors to Savannah will definitely want to check out Forsyth Park with its wide oak-shaded walkways, Fragrant Garden, and iconic water fountain in the center. Other destinations include Telfair Museum, the oldest public art museum in the Southeast, and the birthplace of Juliette Gordon Low, founder of the Girl Scouts. For a scenic stroll, check out the cobblestone streets along the Savannah River that stretch along River Street, one of the top shopping destinations in the region. Savannah has many things for visitors to do, and all of them can be enjoyed even more when you’ve used your travel rewards to get there. You can choose accommodations from among the historic inns and boutique hotels or from well-known hotels like Hyatt, Hilton, Marriott, Starwood, and others. One trip to the historic city almost always leads to a return visit. Because after all, each vacation is like a box of chocolates. You never know what you’re going to get.